Two days removed from a two-point, 54-52 loss against interdistrict rival Pascack Hills, Pascack Valley is looking to rebound and pick up a win before the state tournament begins on Tuesday. PV is the No. 6 seed and will take on No. 11 Demarest at home on Tuesday. But before the state tournament begins, the Indians (10-12) face off against Delbarton (16-6) on Thursday night. The Green Wave enter the game coming off of a 65-61 win over Montville and are the No. 5 seed in the North Jersey, Non-Public A bracket for the state tournament. The game marks the fourth meeting with a parochial opponent this season, and PV is 1-2 thus far and has been outscored 227-199 in those games. Legend Dominguez (22) completes a pass to Alex Lin (14). The tandem had 12 and 28 points, respectively. After a devastating loss in the Bergen County Jamboree tournament, the Indians looked to get back on track on Tuesday night, when they hosted Demarest, but their hopes were quickly dashed with a devastating 65-64 loss. Pascack Valley got off to a slow start in the first half, as they trailed 36-22 at halftime. The Indians were not out of the game, however, as they came out of the locker room at halftime with a new energy. Valley was able to outscore the Norsemen by ten points, 21-11, in the third quarter, cutting the Demarest lead to just four. The Indians outscored the Norsemen again in the fourth quarter, but Demarest's first half lead proved to be insurmountable, as the Valley comeback fell short by the slimmest of margins. Demarest went 15 for 16 at the line in the fourth quarter to help fend off the surging Indians. Junior Alex Lin led the way for the Indians with 21 points on eight field goals. Senior guard Matt Vasel contributed 12 points, while fellow Senior Matt Domville added 11 points. Both teams were very potent from behind the arc, as the two teams combined to hit 19 three pointers. For complete stats from the game, click here. For another summary of the game, click here. With the loss, Pascack Valley fell to 2 games below .500 at 8-10. Despite coming up short last night, the Indians still managed to split their season series with the Norsemen, thanks to 53-45 win in Demarest at the end of December. The Indians will look to get back to their winning ways when they host Tenafly tomorrow night at 7:00 p.m. The Indians had to wait a week to play their first game in the Bergen County Jamboree tournament, after receiving a first-round bye. However, the extra week did not help ninth seeded Pascack Valley on Sunday morning, as they fell to Hackensack, 74-65. Hackensack, which is seeded eighth in the tournament and entered play at 14-5, came out of the gates a bit slow, but Valley was unable to capitalize, as the Indians only led by 5 points at halftime. The Comets came out of the halftime intermission with a new energy, outscoring the Indians 21 to 13 in the third quarter. The two teams played a back-and-forth fourth quarter, with the lead changing hands multiple times, before Hackensack was ultimately able to pull away. Senior guard, Matt Vasel reclaimed the lead for Valley with just under four minutes left to play, but it was short lived thanks to Comet junior Atiba Taylor Jr.
Taylor Jr., who finished the game with 36 points, came down the court and drained a three pointer on the very next possession, putting the Comets up for good, 62-60. The Valley offense was fairly potent throughout the game, as three Indians reached double-digits in points, but 20 turnovers squandered more opportunities. Alex Lin led the way for Pascack Valley in defeat with 19 points, including 3 three-pointers, while Legend Dominguez and Matt Vasel contributed 18 and 16 points respectively. For a complete box score and list of stats, click here. The Bergen Record had a reporter at the game. See their game story here. BBK final. Hackensack d. Pascack Valley, 74-65. With the win, Hackensack advanced to the quarterfinals of the Bergen County tournament, and will take on the number one seed, Bergen Catholic next Sunday. With the loss, the Indians now sit slightly under 0.500 at 8-9. However, PV only dropped one spot in the Bergen Record's Top 25 Teams, from 12 to 13. The boys will get back in action tonight when they host Demarest at 7:00 p.m.
On Wednesday night, the seeds came out for the 61st annual Bergen County Jamboree tournament. Pascack Valley, which is 8-6 thus far this season, was ranked 9th out of 23 teams in the tournament by the Jamboree committee. Since the Indians are ranked in the Top 9, they will receive a first round bye in the tournament, and will playing it's first game in the Round of 16. Since Valley's winning percent is not above .650, they did not earn an automatic bid, but they were able to secure an at-large bid. The Indians were one of five teams to receive an at-large invitation from the Big North Conference. First Round action begins this weekend, as the teams not ranked in the top 9 will vie for a spot in the Round of 16. As a result, the Indians will not make their first tournament appearance until Sunday, February 5, when they will take on the eighth seeded Hackensack at 1:30 p.m. in Tenafly. For the complete schedule of the Jamboree tournament, click here. For a complete list of teams and their seeds, click here. Last year, Pascack Valley was the 13 seed in the tournament, and played Mahwah in the first round. After defeating Mahwah 50-35, the Indians lost to St. Joseph, 77-64 in the Round of 16. The boy's team had a big victory over Ramapo last night at Ramapo. Coming off the win in double over time against DePaul, they came into Tuesday night with some momentum. The final score was PV 55, Ramapo 48. Vasel contributed four three-pointers and finished the night with 19 points. Star point gaurd Legend Dominguez dropped 11 points in the win. The Indians hope to continue this winning streak tomorrow night against Northern Highlands at Pascack Valley, which is going to start a four game home stand. Pascack Valley's starting point guard Legend Dominguez announced via Instagram today that he's committed to Rensselaer Polytechnic Institute (RPI) for basketball. ​Check back later this week for the full story. At the beginning of the week, things were not looking good for the Pascack Valley boys' basketball team. The Indians were 1-5 on the season, and were on a three-game loosing streak. Teams often talk about "turning points" in a season, and this past week was definitely a turning point for the Indians. After a 55-48 upset win against Ridgewood, Valley came into this weekend with some momentum, looking to make up ground. On Friday night, the Indians handed Tenafly their first road loss of the season, defeating the Tigers 57-47. Alex Lin had a huge performance for PV, scoring 25 points, including 2 three-pointers. The only other Indian who reached double-digits in points was Matt Domville, who registered 16 points. However, Valley couldn't rest on their laurels for too long, as they had a short turnaround, playing the next afternoon against DePaul in the Public vs. Private Challenge at Dwight Morrow High School. Pascack Valley, who is unranked in the Bergen Record Top 25, came into the game as a clear underdog, facing off with DePaul, who is ranked eighth. The Indians managed to keep the game close throughout the first half, and led by one point at halftime. However, DePaul came out strong in the third quarter, doubling their first half point total, to take a 46-37 lead. The Indians were not deterred by their lackluster third quarter, producing their highest scoring quarter of the season in the fourth quarter. Tied at 62 at the end of regulation, Valley headed to overtime for the third time this season. Overtime had not treated PV very well in the past, as they dropped both of their overtime contests. This time, on the other hand, the Indians would emerge victorious. After the came was still knotted at the end of the first overtime, Valley managed to pull away in the second overtime, upsetting DePaul 82-75. Alex Lin followed up his 25 point performance on Friday by dropping 26 points, including five three-pointers on Saturday. Matt Vasel led the way with a season-high 31 points and 6 three-pointers en route to victory, while Legend Dominguez contributed 17 points. For more game stats and a complete box score, click here. The Bergen Record had a reporter at the game. Click here for their coverage. BBK final in 2OT. Pascack Valley 82, DePaul 75. PV Vasel 31 pts. For the four time this season, the Pascack Valley boys' basketball team will play on its home court, when they welcome Tenafly on tonight at 7 p.m. The Indians (2-5) are coming off of their second win of the season on Tuesday, when they beat Ridgewood 55-48. Meanwhile, the Tenafly Tigers (6-3) are on a two-game win streak after back-to-back victories against Lodi and Paramus Catholic. The Tigers are clearly comfortable playing on the road, as they have won all three of their road games this season. The Tigers clearly have a potent offense and a stingy defense, as five of their six wins have come by double-digits. On Tuesday afternoon, the Pascack Valley Boys Basketball Team was able to record their second win of the season against Ridgewood. Facing a tough opponent in Ridgewood, the Indians were able to jump out to a 33-15 lead at halftime. Ridgewood came storming back in the third quarter, outscoring the Indians 21-9, but it was too little, too late for the Maroons, as the Indians were able to hold on to win 55-48. ​Alex Lin led the way with 25 points, including two, three pointers, as Valley improved to 2-5 on the season. Matt Vasel contributed 11 points, while Legend Dominguez scored 10 points. They both had two, three point shots. Gabe Millstein scored 14 points, including four three pointers in a losing effort for the Maroons. This victory is somewhat of an upset for the Indians, as Ridgewood entered the game at 5-2 on a five game winning streak. Meanwhile, PV had lost three game in a row. 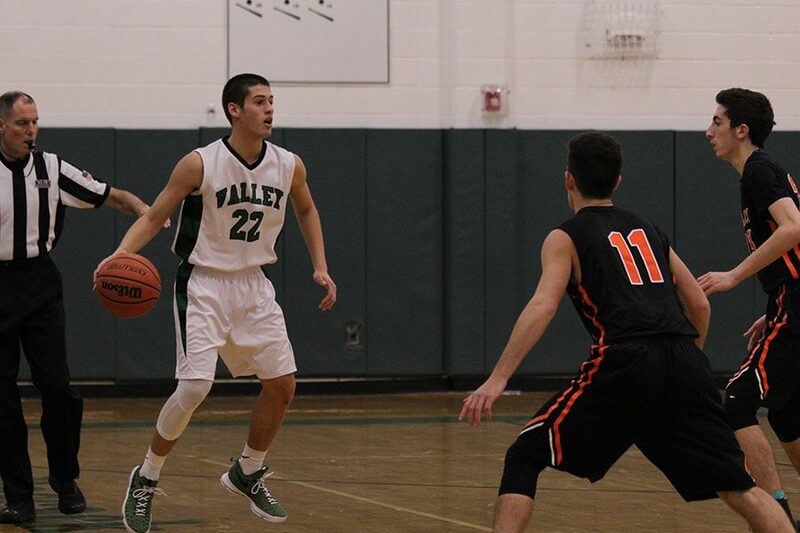 Pascack Valley will take try to defend their home court, when they host Tenafly on Friday at 7:00 p.m. The Tigers enter play at 6-3.